I assume that not all LIBREAS readers at first knew what might be meant by the current issue’s main focus “library culture”. 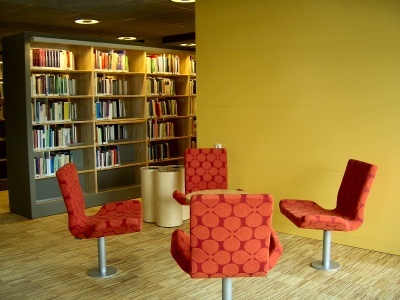 In this short report I’m going to summarize how I found – while currently studying in Sweden – my own definition of “library culture” and furthermore I will introduce a new library building in the (not so far) north as well: the recently opened Växjö universitetsbibliotek[Fn1]. Since January I’m an exchange student at Växjö universitet while the official opening of the new library building took place on January 16th. As soon as I revealed myself as a “library person” during a guided library tour I found myself instantly in happiest accompany. 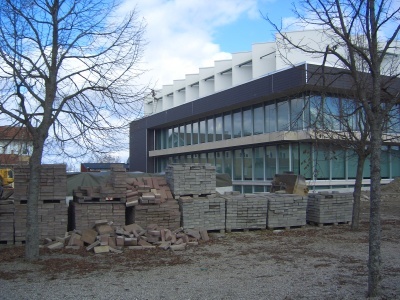 At this time parts of the libraries’ ceiling were still not finished – so far two quite new experiences merged on the same day for a student used to “diffidence” and “order” in German university libraries. In the following weeks I experienced myself in a quite different way of “acting in a library” and considering the libraries’ inner life I noticed different patterns of user and staff behaviour and therefore – by comparing my experiences in German university libraries and those I made or I am still making in the “final building phase” of Växjö universitetsbibliotek – I found out what “library culture” means to me. From the beginning this university library made me feel of a folksy place where I’m looking forward to go with joy – either to work e.g. with classmates in one of the 32 various sized group rooms which can be booked online or to meet friends – aside from studying – on weekend days for a coffee in libraries’ Café “Astrakan”, where you can find most happy and friendly staff imaginable on a Sunday. This experience might not be a special new note for German students in general – but for me it is! Besides Uppsala universitetsbibliotek[Fn2], Växjö universitetsbibliotek has the longest opening hours of university libraries in Sweden: On weekdays you can use the library from 8 in the morning till 10 in the evening (Monday – Thursday) or 6 in the evening (Friday). I’m especially sold on the opening hours on Saturday (10 AM – 6 PM) and Sunday (12 AM – 6 PM). The evening and weekend service is possible by employing Library and Information Science students[Fn3] which means a somehow limited service (e.g. regarding the reference and other information desk services) for users in the late hours of the day and on weekends. This seems to me to be a bearable “drawback” as from my experience most students using the library at these times rather come for simply reading and writing papers. They are escaping to the library from the diversest kinds of distractions they usually have to deal with in the student housings. As a student used to quietness (or even silence) in the Prussian State Library reading rooms and not being allowed to bring any food or drinks (except of course as you may know the SLUB[Fn4] in Dresden because of some planning inadvertence of the air conditioning) you might feel queasy in Växjö’s hall at the beginning. Sometimes I even found myself on the verge of doing the “Psssst” (for German readers) or the “Shhhh!” (for international readers) people back home have to face if they are talking between the stacks and of course I did this turning around with a glare glance to the annoying group of guys dressed like going out on a Friday night on a Monday morning. Fortunately most of the exchange students (including me) hardly understand the Swedish language so you’re not disturbed by listening to exciting girl talks about all the topics girls usually prefer talk about instead of reading the 1000 pages tome on “Management Accounting”. However if you still feel disturbed you can use one of the two silent reading rooms on the 2nd floor. Students are allowed to take in their bags, backpacks, coats, jackets and anything else one may carry around on a day spend on the campus. Of course the library offers lockers inside the library on the first floor but using it is an option not a command. Sometimes the students even bring coffee and sandwiches to their work places. The library staff first tried to get control of this behaviour, which looks even fearsome to the liberal Swedish librarians, but meanwhile, as the staff and the books are actually not extraordinarily threatened and there are enough possibilities to however keep one’s privacy and calmness, they stopped worrying and trust in the student’s sanity and honesty – and of course also Swedish libraries have a flawless working theft detection system. Växjö University got a new library building already in summer 1995. At this time the reopening was a merging of two old library holdings, the old library building and the Special Library for Teacher Education. 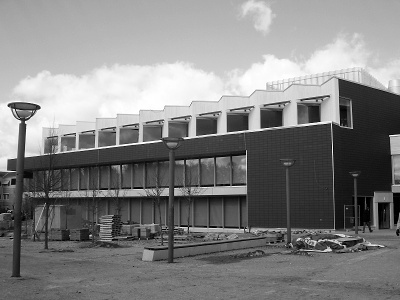 As I already mentioned there is a small building delay in completion of the current new building: The original plan was to open the ready-made building right after Christmas – the complete renewal is supposed to be finished in autumn 2006. 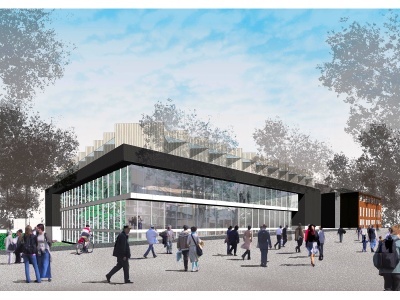 According to the information given by the library staff there’ll be no other new building within the next 10 years. The current one is reasonable also factoring possible extension needs: In 1999 Växjö University became a full university (professorship, doctoral degrees) and had to integrate the holdings of the former separated School of Nursing and Social Work and the School of Police Education. The holdings now comprise an amount of 225.000 books, additionally journals, magazines and newspapers in all the languages which are taught at the university. Taken all together the place is supposed to be spacey enough to hold 350.000 books. 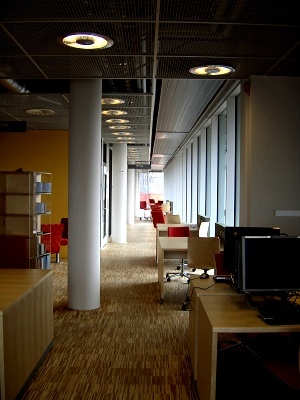 Working and computer places, study rooms, language and media laboratory and a multimedia room are spread of three library levels. What more to say about my almost completely positive experiences? A general trend for new buildings is implemented in this new building: Växjö universitetsbibliotek has no closed stacks. Instead it follows consistently the principle of open access to the holdings. The main holding part (e.g. parliament and government publications) is even placed in the libraries’ centre. More than 90 % of the holdings will be freely accessible when the building is finished in August 2006. To be abroad and using a library in a foreign country enables you to understand library culture expressed – of course – by the DOs and DONTs, but as well by the way the collections are organized and the building is designed. And most of all you learn about a foreign library culture by experiencing and watching the ordinary people of a country using a library. Maxi Kindling studiert Bibliothekswissenschaft und Germanistische Linguistik (Magister) an der Humboldt-Universität zu Berlin.